Those who know me know that I played baseball all of my life and have coached either professionally or for my son’s team for almost 15 years. I love baseball! It is a wonderful game with many traditions and superstitions and wonderful history. It is a great game to play and can provide kids who play the game with a life time of memories. However, I have come to realize the best part of baseball are the life lessons that can be learned while playing. Jackson, my 9 year old son, and I finished the summer baseball season on Saturday. I am the coach and Jackson mostly pitched and caught this summer. We had a good little team and finished with a flurry in the tournament. We did not win the tournament, but the boys really learned a great deal and improved each game. It was fun to watch them play on Saturday. 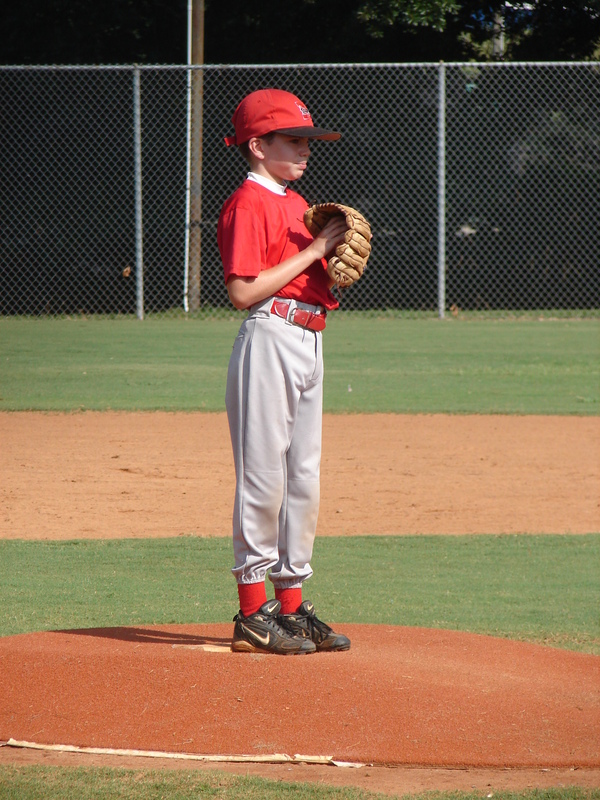 Jackson was the starting pitcher on Saturday. I planned for him to pitch 3 innings and then we would go from there. The game began with us scoring one run in the top of the first. We go out on defense and at the end of the inning the score was 5-1 with the opposing team getting one hit during the inning. We had 0 walks in the inning, but we unfortunately made 5 errors! It really was a painful inning to watch. I was worried about Jackson as the inning was going along. It was interesting to watch him react to the errors (his reaction was no reaction at all) and the inning really getting away from us. We got out of the inning and we came off the field with our heads down. I gave them a pretty direct pep talk and the game continued. We battled and scored a couple of runs to get back in the game. The score was 5-3 going into the bottom of the 2nd. What happened over the next 4 innings was inspiring to watch. Jackson went out in the 2nd and threw all of 9 pitches with some really good defense played behind him and he threw all of 8 pitches in the 3rd with the good defense continuing. (If we could have played that kind of defense in the first inning we would be winning at this point!) Keep in mind the average number of pitches per inning in a major league game is between 15 and 20; these boys are 9 & 10 years old and have only been playing kid pitch baseball for no more than two years. At this point I decide to send him back out in the 4th even though he was only scheduled to go 3 innings. Jackson only threw 11 pitches in the 4th! We were playing well as a team and trying to catch up. I took a chance and sent Jackson out for the 5th inning. During this inning I learned a lot about my son as a baseball player, but more importantly as person. Jackson hits the first batter with the first pitch. This alone can really rattle a young pitcher as they do not want to hurt anyone. He gets ahead of the next hitter 0-2, but left the next pitch up and the kid crushed the ball way over our centerfielder’s head and gets an inside the park home run. I’m very concerned at this point about Jackson’s mental state. He was still looking great physically as his fastball was as good in the 5th as it was in the 1st. I make my only trip to the mound of the game and he is furious about what has just happened! He had a look in his eye that I have never seen him have before. I asked him did he want to continue and he responded with an emphatic nod of the head and strong yes through clinched teeth. I couldn’t help but be proud of him at this point. I left him in knowing that they had two more very good hitters coming up next. The next hitter crushes a double and then Jackson had his second walk of the game. I am really anxious at this point and am thinking about taking him out of the game, but something told me to leave him in and see what happened. We have an easy ground ball to second with turned into our 6th error of the game, but our first error since the first inning. We now have bases loaded and no outs. We bring the infield in to try and cut down the runs at the plate. Jackson proceeds to strike out the next two batters and get the last batter to hit an easy pop up to the shortstop! We got out of the inning with no more damage! I saw my son truly compete for the first time in his life! He did not get rattled and he did not lose focus. It was a very proud moment for his coach and his dad. 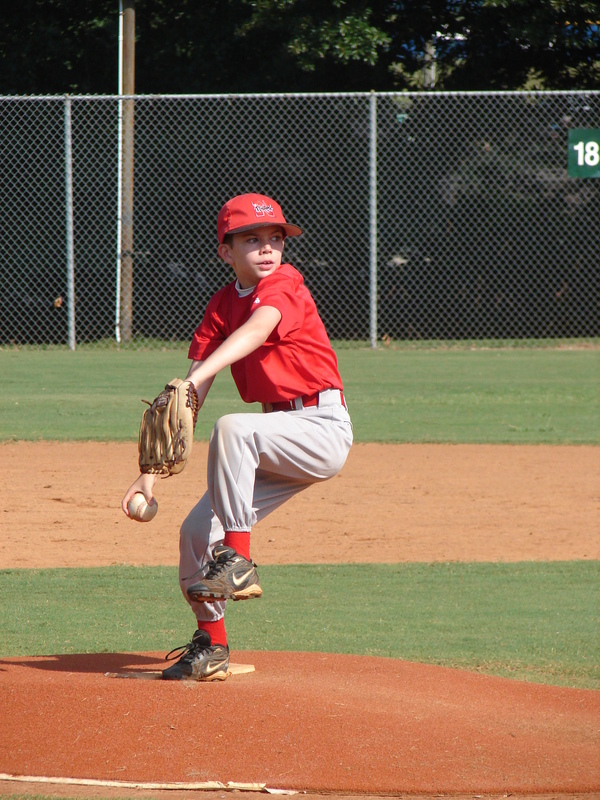 Even though pitching is very individualistic in nature, you have to have some help from your teammates. There are many times in life where we feel like we are alone here on earth. We may have a great relationship with God, but we need people around us to help us get through the tough times and celebrate the victories of life. Do you have teammates in your life? Do you have people to support you, love you, hold you accountable and to celebrate with? No one on the field wants to lose; No one on the field intentionally makes errors; Everyone on the field is human. How a pitcher responds to errors and bad play speaks a great deal about him as a person. God created us all with good hearts. Some good hearts go bad and there are definitely people who do terrible things to others. However, most people don’t do things to us intentionally to cause us harm, but sometimes cause us grief, heartache, and frustration without knowing it. Sometimes these people are family members, co-workers or fellow church people. How we respond to people who do things to us that cause us pain tells a great deal about our hearts and our relationship with God. How do you respond to negativity in your life caused by those around you? Sometimes pitchers cause themselves to get into some tough jams whether it is from giving up hits, hitting batters or walking people. This situation is often times more difficult to deal with than when teammates make errors. How the pitcher responds to this situation is very telling about how he will handle himself as a man when he makes mistakes. Children are really good at trying to blame someone else for something they did wrong. Unfortuantely adults are pretty good at it as well. A favorite quote of the head baseball coach at Middle Tennessee State University is “you have stand on your own two feet.” We live in a world where blaming others is so easy and tempting to do. It seems that personal accountability is fading away a little everyday. How we respond to our own mistakes is directly related to how we were raised and our realtionship with God. Responsible people are willing to accept the responsibility for their errors, try to correct them and make the necessary changes to prevent the same thing from happening again. Even better for Christians is that we know God will forgive us for our errors if we ask. Baseball is a beautiful game. It has helped make me the man I am today. I received a wonderful reminder on Saturday of just how great a game it is and that my 9 year old son is beginning to experience what I did. I love baseball. I love my son. I love my God. What a fantastic testimony of your dedication to being a father to your son Jackson. As I read the article about the game, I envisioned Jackson’s demeanor and competiveness and also your guidance as his father and coach. What a refreshing look at, not the game of baseall, but at the character of a young man being chisled right before your eyes. Thanks for all you do for, not just Jackson, but all the kids you have positively influenced and all the rest of us dads. PreviousPastors: 3 reasons it is the right time to talk about money! NextSilence on giving; HUGE error and risk for pastors!